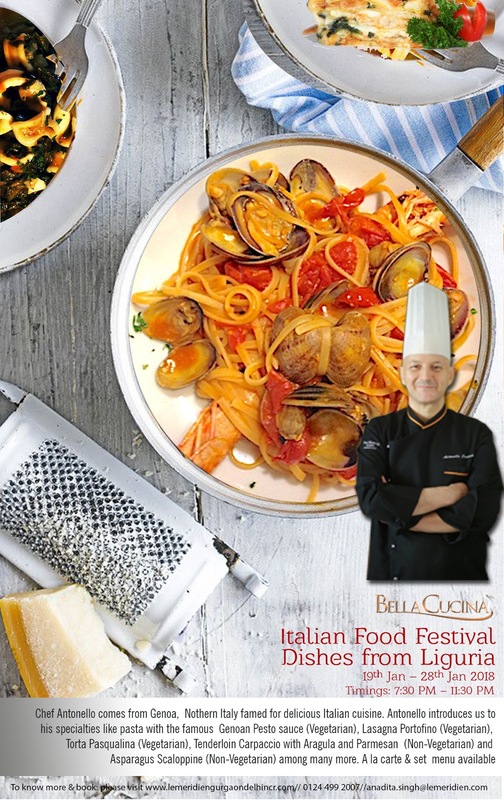 In this blog post, I cover the Italian Food Promotion which is currently underway at Bella Cucina, Le Meridien Gurgaon, from January 19 - 28. A visit to Bella Cucina was long overdue. 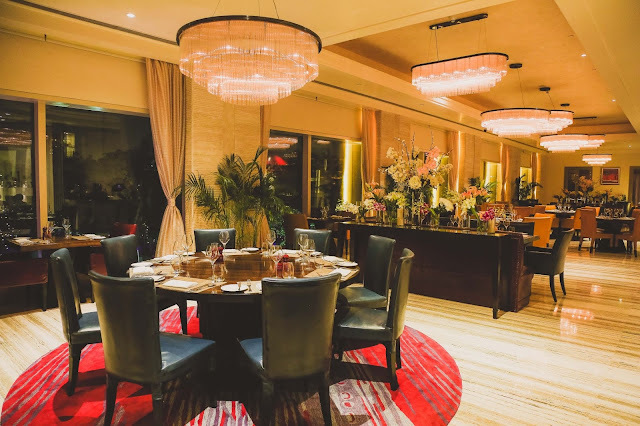 The newly opened Italian restaurant in Le Meridien Gurgaon is lauded for serving some of the most talked of delicacies influenced by the central and northern regions of Italy. Some of the signature dishes served here include Caprese Salad, Seared Yellow Fin Tuna with Poached Egg, Burnt Garlic and Spinach Risotto, Confit Chicken Tortellini, Braised Pork Belly, Chicken Parmigiana, Scallop and Tiger Prawns, Dropped Lemon Tart, and Eight Layer Chocolate Cake. The restaurant also boasts of impressive Italian wines and cocktails/mocktails. But wait, that's not the only reason you'd fall in love with Bella Cucina. At the heart of its beautiful kitchen lies an imported Molteni - a legend in premium stoves - born into ancient craftsmanship, wisdom, and detail. No two Moltenis are the same; the one in Bella Cucina is custom-made for the chef's needs. 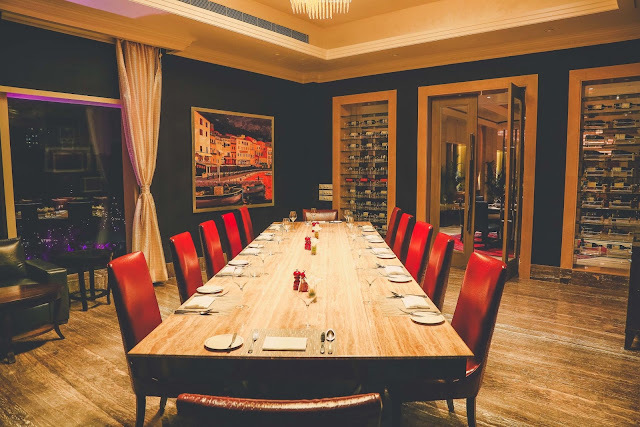 What impressed me the most about Bella Cucina was its classic decor with pristine creamy sandstone and travertine marble finish, rich colorful leather seating, and three private dining rooms. It's like a playful coming together of artistic pieces, transporting you straight to the regions of Italy and its culture and cuisine. Quite naturally, Chef Antonello's visit proved to be like the icing on the cake! For the uninitiated, Antonello Cancedda is an Italian chef who comes from Genoa, the historical port city of Northern Italy which is steeped in arts and culture. Hailed as a master in his craft, he brings with him over two decades of experience in authentic Italian fare. For six years in a row, Antonello has spent time in India, heading Italian restaurants of leading hotel chains in the country. A graduate of Scuola Alberghiera Restaurant and Hotel School of Genoa and an alumnus of Hotel and Restaurant School of Alassio, Italy, Antonello has had the fortune of working in Europe, United States, Canada, and now Asia. Over the years, Antonello has developed a keen understanding of the Indian palette and improvised his style of authentic Italian cuisine for the discerning Indian audience. A little-known fact about Chef Antonello, which we got to know during the food promotion, is his passion for strumming the guitar and belting out popular Hindi and English songs. 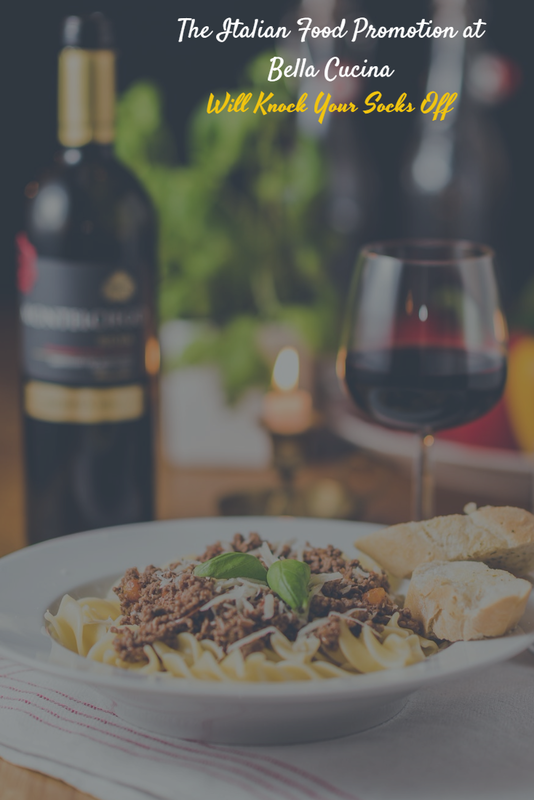 In this food promotion, Antonello introduces us to the Ligurian cuisine with specialties like the Lasagna Portofino, Torta Pasqualina, Tenderloin Carpaccio with Arugula Parmesan and Asparagus Scaloppine, Pasta with famous Genoan Pesto Sauce, among many more. This exotic seafood salad is made of salmon caviar, scampi, lobster, and salsa verde. An absolute must-have if you're an admirer of quality seafood. Italian flatbread baked with cheese, pine nuts, onions, basil, and olive oil. A perfect treat for vegetarians, this Genoese style soup is made of eggplant, spinach, red beans, and basil pesto. This delicious Lasagna is made of basil pesto, green beans, pine nuts, eggs, and Parmesan cheese. You'll love this stewed cuttlefish with artichokes, anchovies, carrots, and celery. This dessert contains melt-in-your-mouth baked peaches with amaretto cookies, whipped cream, and toasted hazelnut. The food festival timings are from 7:30 P.M. – 11:30 P.M. with both options of à la carte and set menu. So, what are you waiting for? Head straight to Bella Cucina, which is Italian for a beautiful kitchen.